﻿﻿﻿﻿﻿﻿﻿A little Flashlight 101 to help you select the right illuminator. By ﻿﻿Robert A. Ramirez Sr.
We used to just call them flashlights. Long tubes with a lens at one end, filled with big batteries. One size fit all. Not so today, as we now choose from a confusing array of headlamps, lanterns, LED lights and shake flashlights, just to name a few. The range of costs is wide as well. Still, all these different flashlights are made of the same basic components. Body: Flashlight bodies are usually made of aluminum or plastic/polymer. Aluminum is common on high-quality lights because of its durability and heat dissipation. Plastic can be easily molded, so there’s a great variety of shapes and sizes. Plastic can also resist corrosion and wear. Bulbs: Once-common incandescent bulbs are the least expensive, but they have a short life and emit heat. Light-emitting diodes (LED) are more efficient and durable, but are also more expensive. Reflectors: A polished surface throws the light into a directed beam. An “orange peel” texture can improve the uniformity of the light beam. Variable-focus reflectors allow a wide floodlight to narrow to a beam effect. Lenses: Lenses can be a flat transparent plastic or glass cover. A “bull’s-eye” or convex lens is also used to form a concentrated beam. Power source: Battery choices include disposable or rechargeable. Lithium-ion batteries have a longer run time, making them ideal for hikes or long trips, though our Texas heat may lessen their shelf life somewhat. Control switch: Most are top-mounted or end-mounted, but they don’t just turn the flashlight on and off. Operating modes include intermittent use, SOS signaling, strobe and variable output levels. 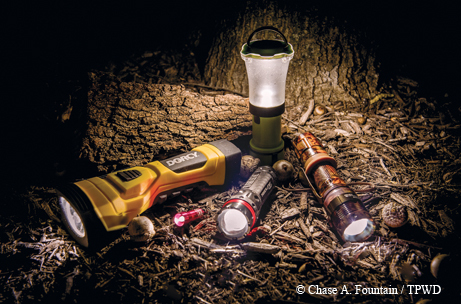 Pro tips: When choosing a flashlight, consider the functions you’ll need. A floodlight illuminates a wide area easily, but a spotlight has a clearly defined “hot spot” and very little peripheral spill. Large flashlights are powerful, but they’re also heavier. A headlamp keeps your hands free while walking and setting up camp in the dark. LED lights have more than 10 times the battery life, so you won’t have to carry extras. With all of these options, remember to do some research before you buy. With planning, you can find one that will light your way for years to come — or at least until the next “must have” innovation comes along.